The purpose of this article is to discuss the M1 Garand gas cycle and the effects of using commercial ammunition in the rifle. In this article we'll measure and discuss the gas cycle pressure for several different brands of ammunition. It is commonly stated that shooting commercial ammunition in the M1 Garand will cause damage to the operating rod. With the supply of M2 Ball ammunition dwindling, it seemed an appropriate time to investigate this topic and look for solutions. Several manufacturers sell a venting type of gas screw that addresses the potential of high pressure in the gas cylinder. John Garand patented such a device for the M1 in 1945 (Patent #2369669). The venting gas screw works by bleeding gas out of the gas cylinder. I am going to present a different solution to the potential high-pressure problem, one that I believe is more elegant and simple in design and use. At GarandGear.com we have designed a new ported gas screw for use in the M1 Garand. Unlike a venting gas screw, our product works by changing the initial conditions in the gas cylinder. The ported gas screw increases the starting volume in the gas cylinder, which results in lower peak pressures. No adjustments are required and no gas will vent from the device. The ported gas screw will produce lower peak pressures in all brands of ammunition that meet the SAAMI specifications for the 30-06 cartridge, regardless of bullet weight. To evaluate the design of the ported gas screw, several sets of pressure data was acquired. The first data set measures the gas cycle when using standard M2 ball ammunition. This initial data set will define the accepted "safe" operating range for the M1 Garand gas cycle. The second data set surveys several brands of commercial ammunition. This data set was then compared against the M2 ball pressure set. 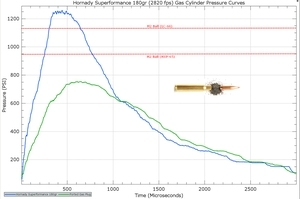 Finally, the ported gas screw design was tested and its ability to lower peak pressures was verified. The most useful data for this investigation is obtained by measuring the actual gas pressure in the gas cylinder, rather than at the barrel gas port. 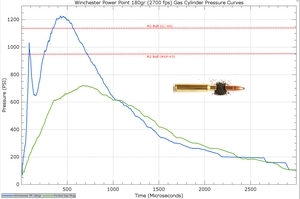 The gas cylinder pressure is easier to obtain than measuring the barrel port pressure. Measuring the pressure in the gas cylinder also saves us the effort of trying to model the gas transfer into the gas cylinder. I will discuss why the modeling of the gas transfer is challenging later in the article. The pressure pulse in the gas cylinder is very short, approximately four milliseconds. A high-speed pressure transducer was required for the test along with all the associated amplifiers, computers, and data acquisition systems. The transducer also needed to be able to survive in a high temperature environment. A suitable pressure sensor was chosen and purchased for the test. Two custom gas screws where machined that would house the pressure transducer. 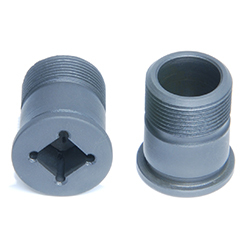 The first gas screw would act like a standard GI gas screw; the second emulated the port in the ported gas screw. The rifle used for the test was a 2.5M range Springfield Armory Garand purchased from the CMP. The rifle had a new criterion barrel installed. All of the gas cylinder and operating rod components where inspected, measured and verified to be in spec. The barrel gas port was inspected and verified to also be in spec. A new USGI spec operating rod spring was installed and the rifle was properly lubricated. Figure 1 shows the sensor installed in the rifle. To interpret the data provided, we will need to define the gas cycle. 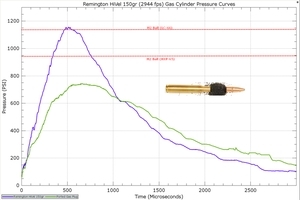 The gas cycle on the M1 Garand can be broken up into several distinct stages. 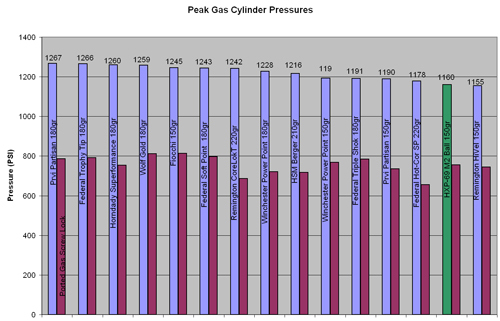 Each stage affects how the pressure in the gas cylinder is changing. The Gas cylinder and operating rod assembly on the M1 are lossy. That is to say, gas is always flowing past the gas piston when the pressure in the gas cylinder is greater than the pressure outside of the gas cylinder. The following stages will deal with gas flowing into the gas cylinder. 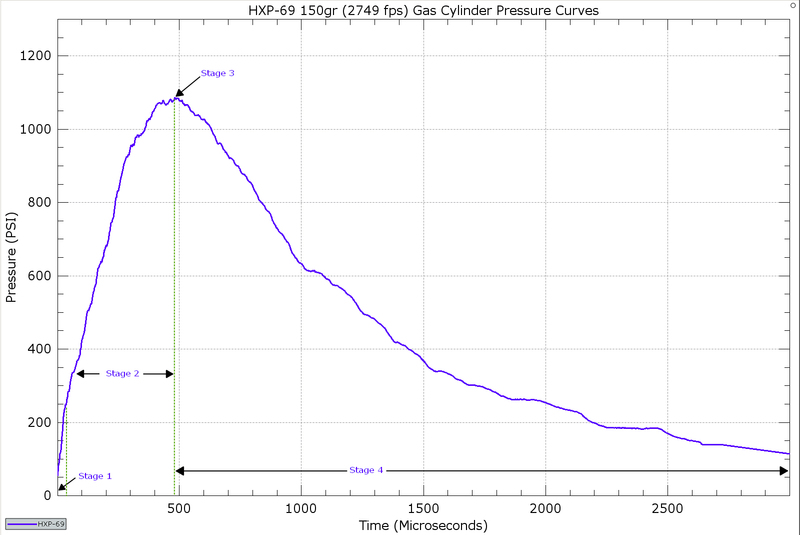 A graph of a typical gas cycle when using M2 ball (HXP) is shown in Figure 2. Stage 0: The first stage consists of the bullet traveling up the barrel, compressing the air in front of it. The bullet moves up the barrel faster than the gas can escape from it. This causes the pressure to rises in the barrel. This stage ends when the bullet has moved up the barrel and is blocking the gas port. The compressive force of the bullet traveling up the barrel combined with gas blow-by will pressurize the gas cylinder to approximately 10psi. This initial pressure transient is what we use to start the data acquisition process. Stage 1: This stage is defined as the bullet having moved forward of the gas port, but is still in the barrel. This stage is responsible for the highest rate of change of pressure over time (dp/dt). However, it is also the shortest of the stages, lasting approximately 46 microseconds. Stage 2: The bulk of the gas transfer will occur during this stage. The bullet has left the barrel and the barrel is now rapidly depressurizing. However, the pressure in the barrel is still greater than that in the gas cylinder; therefore, gas continues to flow from the barrel into the gas cylinder. 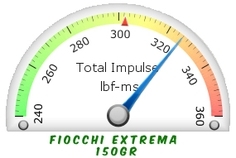 Stage 3: Pressure equalization has occurred in this stage. 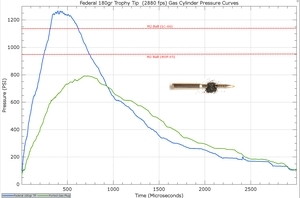 It marks the point of peak pressure in the gas cylinder. From this point forward, gas will be flowing from the gas cylinder back into the barrel. Gas is also flowing past the piston and exiting the gas cylinder as previously mentioned. 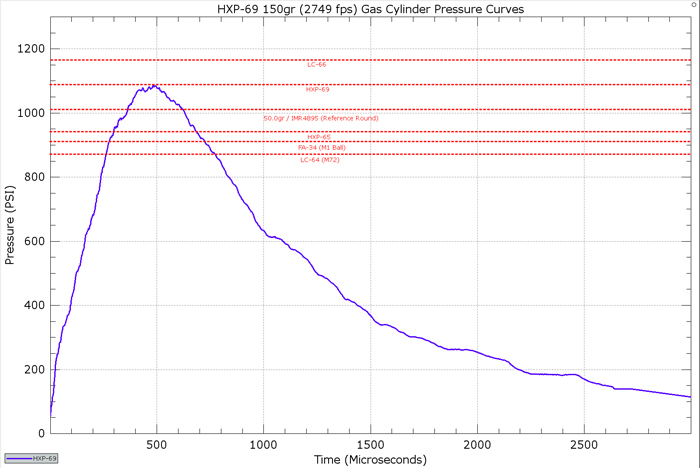 Stage 4: The gas cylinder is depressurizing. 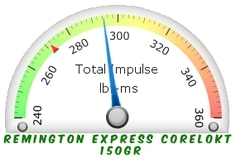 This stage normally lasts approximately three milliseconds. Stage 5: The M1 Gas cycle is now complete. The gas cylinder has depressurized. 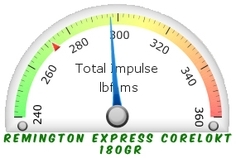 The operating rod has reached its peak momentum. 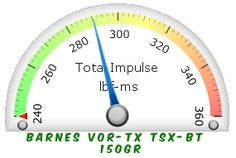 At this point the operating rod has moved rearward approximately 3/8 of an inch. The operating rod will coast rearward using the kinetic energy it gained to perform functions such as: unlocking the bolt, extracting the empty cartridge case, cocking the hammer, and compressing the operating rod spring. As mentioned in the introduction, the modeling of gas flowing from the barrel into the gas cylinder is very difficult. This is because the modeling of the flow of gas through the gas port has several variables that are not easily determined. The flow of gas from the barrel to the gas cylinder is choked through the barrel port and is not linear. 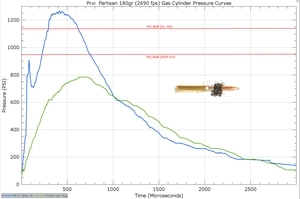 For this reason, we cannot use barrel pressure alone as an indication of the peak pressure seen in the gas cylinder. Bullet velocity plays an important role in determining the final peak pressure seen in the gas cylinder. 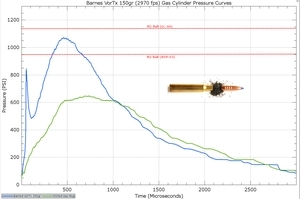 As bullet velocity increases, the time to transfer gas into the gas cylinder decreases. This factor is often overlooked and under appreciated. The time spent in Stage 1 decreases as bullet velocity increases. This effect moderates the possible peak pressures. For example, if two bullets are fired and each reach the gas port with the same barrel pressure but different velocities, the slower bullet will produce higher peak pressures in the gas cylinder. We chose M2 Ball to be our benchmark for what a safe gas cycle should look like. 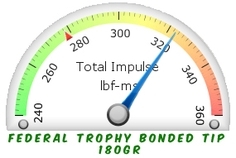 This is reasonable since the M1 Garand in its current configuration is designed to use M2 ball ammunition. The ported gas screw will prevent pressures from exceeding this base line when shooting other types of ammunition. Our initial pressure testing showed that the pressure curve varied significantly between different years of production and manufacturers. To be safe, we choose the lowest peak pressure measured as the value that the ported gas screw should never exceed when using commercial ammunition. 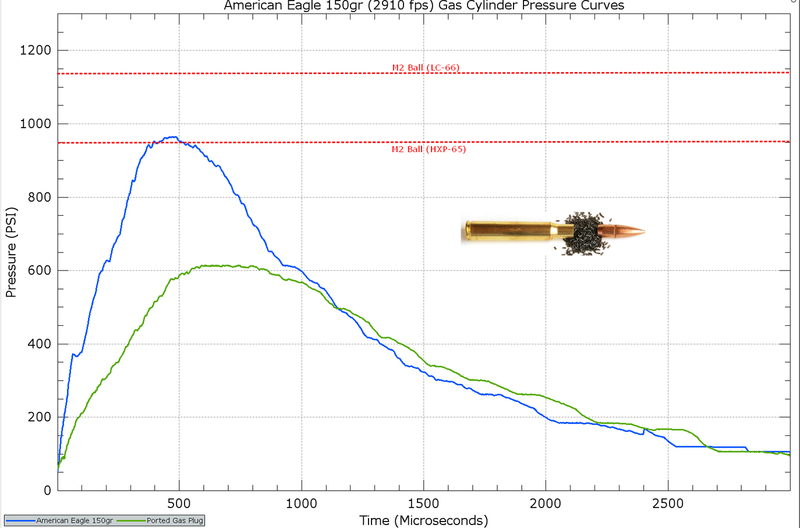 Figure 3 below shows one pressure curve and the peak pressures measured from several different years of M2 ball ammunition. For historic reasons we also tested M1 ball ammunition and included the results in the graph. The Army technical manual [TM 43-0001-27] describes M2 ball ammunition as being loaded with 50gr of IMR4895. For reference, this load is also included in the figure. When a cartridge is fired, it has a limited amount of gas that can be transferred to the gas cylinder before the pressure decays. 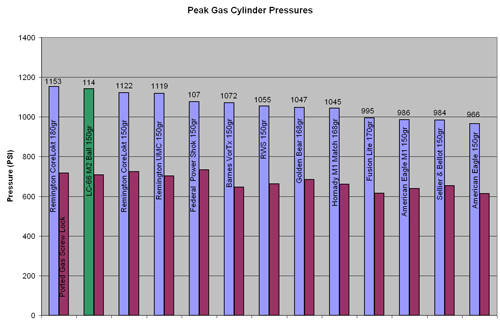 If we increase the volume of the gas cylinder – by means of the port, the resulting peak pressure must decrease. Peak pressure is the component that can cause damage to the operating rod. Total impulse is the component that determines if the rifle cycles correctly. 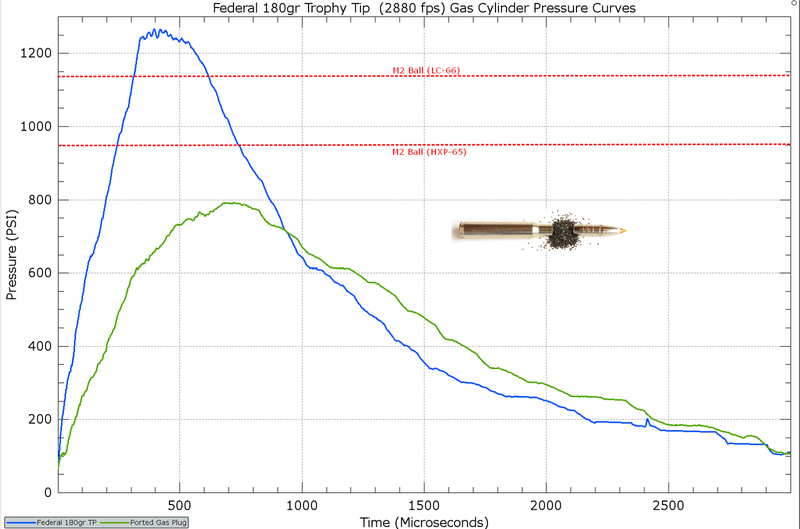 In simple terms, total impulse is the area under the pressure curve times a constant. 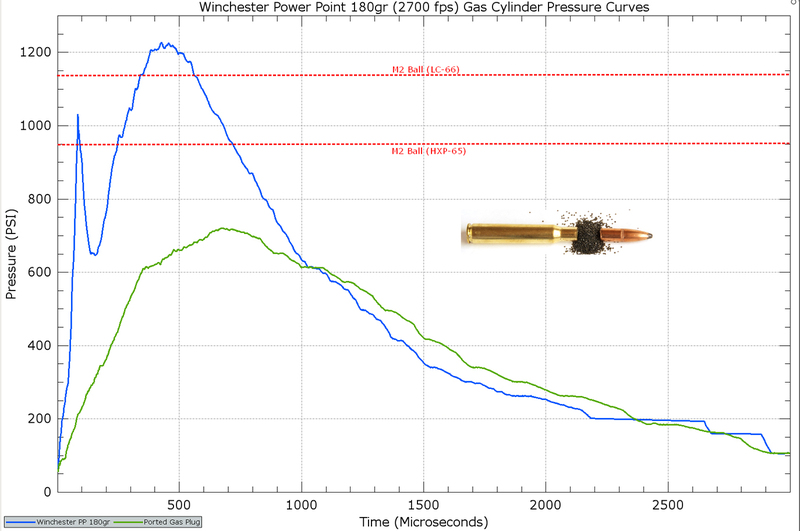 A venting gas screw drops peak pressure and it drops total impulse. The ported design drops peak pressure and preserves most of the total impulse potential. The result of this design is that the ported gas screw can correctly cycle the rifle at lower peak pressures when compared against a venting style of gas screw. Reducing the peak pressure lowers the acceleration of the operating rod, and helps reduces the wear and tear on sliding parts and bearing surfaces. Several of the most common brands of ammunition were purchased for testing. Each of the following graphs will list the brand tested, and show two pressure curves. The first curve is the pressure generated when the ammunition was fired using a standard GI gas cylinder screw. 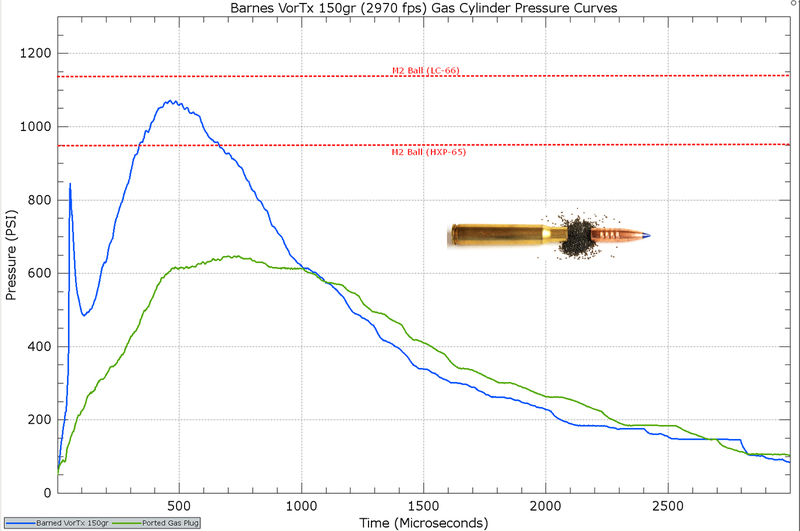 The second graph will show the pressure curve when the GarandGear ported gas screw was installed. 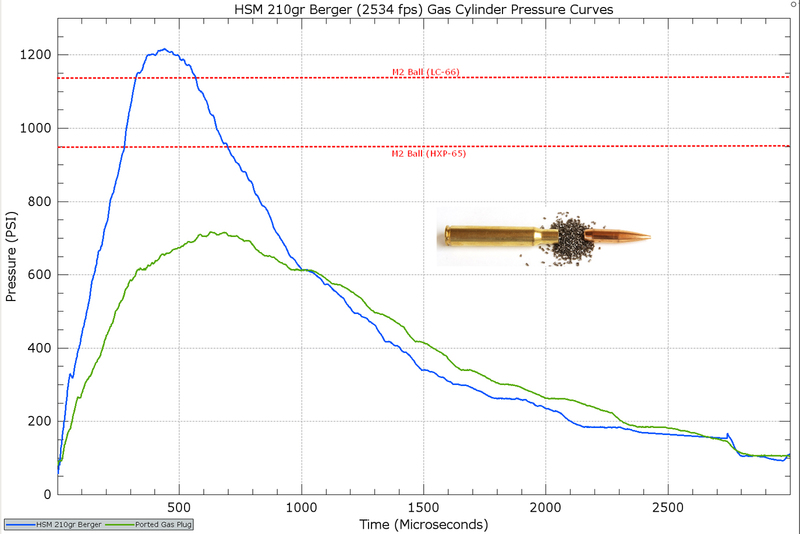 Two M2 ball reference lines are included for comparison purposes in each graph. The velocities listed in the graphs are actual velocities measured using a chronograph. It is important to mention that the commercial ammunition tested is for a specific lot number. The manufacturers can change the load at any time, and without warning. 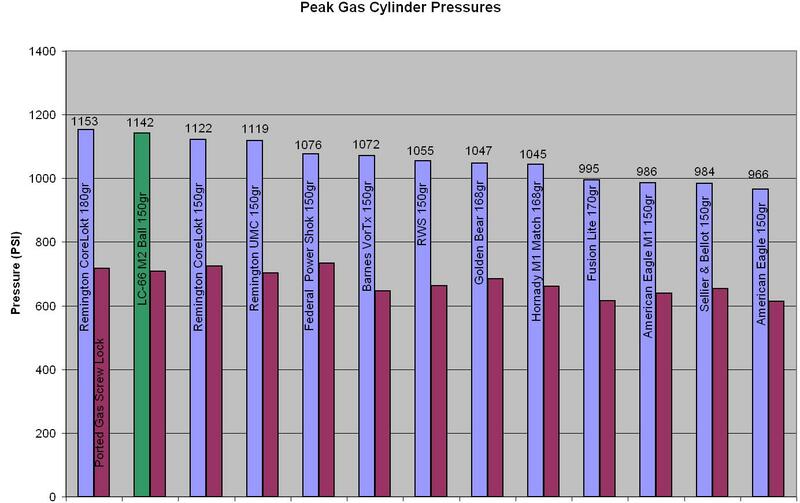 Some of the loads tested do not produce excessive peak pressures. This can change without notice if the manufacture reformulates their ammunition. You can click on any of the graphs below to see the full sized image. 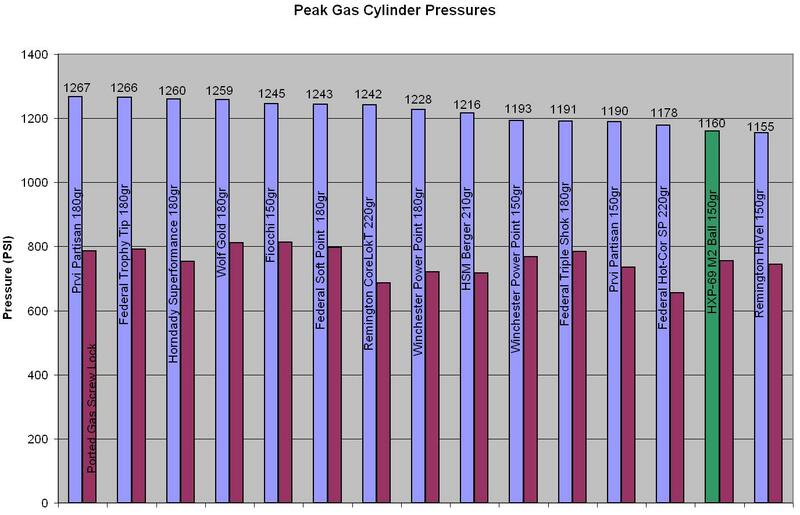 The following charts summarize the peak pressures measured during this experiment. 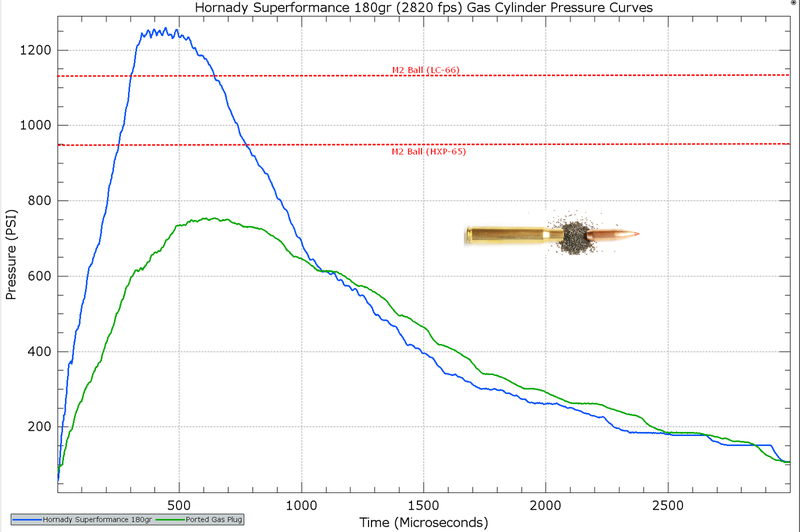 It also shows how effective the ported gas plug is at reducing peak pressures. 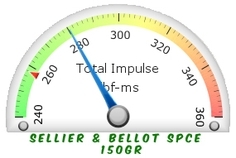 In the graphs below the two green bars are two different years of M2 Ball ammunition. Impulse is defined as the integral of force over time. 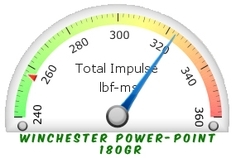 If we take the measured pressures and convert those measurements to a force applied to the operating rod and sum all the results we end up with the total impulse applied to the operating rod. 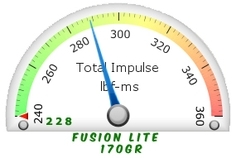 This total impulse is what determines the final momentum of the operating rod which in turn determines the bolt speed. If there isn't enough momentum applied to the operating rod then the rifle short strokes. If too much momentum is applied to the operating rod then accelerated wear on the receiver occurs. 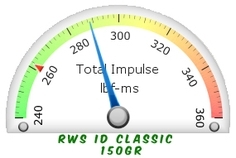 The following graphs shows the calculated total impulse for each round tested. To understand the graphs, let us examine the following example below. 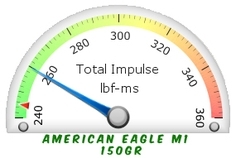 The graph below shows the total impulse measured for a standard M2 Ball cartridge. 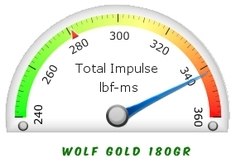 The total impulse for various years and makes of M2 Ball ammunition falls between 274 and 305 lbf-ms. Total impulse values larger than this will result in faster bolt speeds (as compared to M2 Ball) and values less than this will result in slower bolt speeds. 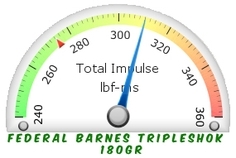 A rifle begins to short stroke with a value of approximately 190 lbf-ms. This assumes that everything is in spec and the rifle is properly lubricated. 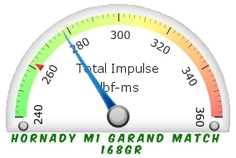 The graph above is showing several parameters. Firstly, in each graph is the blue pointer. 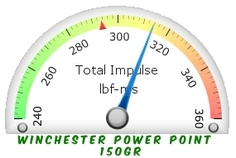 This will point to the measured total impulse for the given cartridge when fired with a standard USGI gas screw installed. 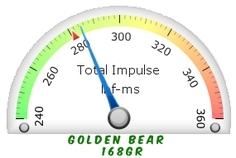 The small red pointer is the total impulse for the given cartridge when fired with the garandgear ported gas screw installed. 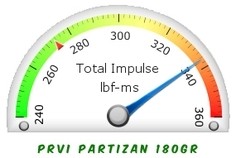 In a perfect lossless environment the two total impulses would be the same. However, the M1 Garand gas system is very lossy (leaks gas). The longer gas cycle provided by the ported gas plug results in a reduction of the total impulse. Three factors can result in damage occurring to the operating rod. The first is high pressure in the gas cylinder. The second is binding of the operating rod. The third is caused by poor lubrication. If any two of the three conditions are present, then damage is possible. If the operating rod is binding, the operating rod will flex and bend when cycling until the bind is overcome. It is also possible to damage the operating rod if the rifle is incorrectly field stripped. You should never force the operating rod out of the rifle when field stripping it. When possible choose ammunition that doesn't exceed M2 ball in both peak pressures and total impulse. Using a venting or ported gas screw is a safe way to utilize commercial ammunition in your M1 Garand. From the graphs and data above, it was verified that the ported gas plug limited peak pressures in all cases to levels below that of M2 Ball. 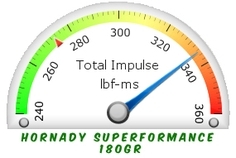 The ported plug also reduced the total impulse on all of the rounds tested. The ported gas plug has the added benefit of requiring no adjustments when switching ammunition. In the future, additional commercial cartridges will be tested. If you have a brand of ammunition that we did not test, please feel free to contact us.